Peel, core and slice apples. In food processor, grate apples (in batches, if needed). Place in slow cooker. Stir in brown sugar, salt and cinnamon stick. Remove and reserve cinnamon stick. In food processor, puree apple mixture (in batches, if needed) until smooth. Return to slow cooker with cinnamon stick. Cook uncovered on High heat setting 4 hours longer, stirring occasionally. Remove and discard cinnamon stick. Cool completely. Transfer butter to jars; seal tightly. Store in refrigerator up to 3 weeks. 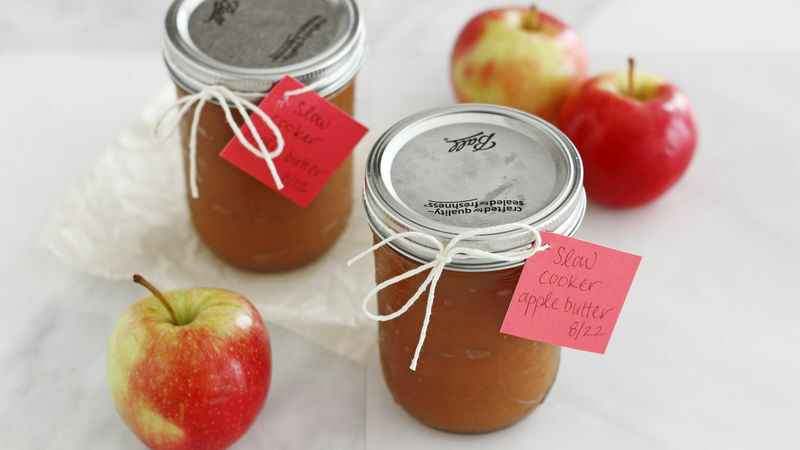 Package jars of apple butter with pretty ribbons and tags to give away as gifts. Substitute McIntosh or Golden Delicious apples, or a combination, for the Gala apples. Apple butter, a sweet spread commonly used on English muffins, get its name from its smooth and spreadable consistency, rather than its ingredient list. There is no butter in apple butter, but we promise that doesn’t make it any less delicious! The key to a thick and hearty apple butter actually starts with the cooking method. Apples are cooked low and slow until the sugar in the apples caramelizes. This technique is what gives apple butter its rich color and dense spreadable texture. Our Slow-Cooker Apple Butter recipe uses brown sugar to get a jump start on the caramelization process! If after making this recipe you ready for more apple recipes, check out our assortment of syrup, sauce, and cider recipes or dive deep into the art of baking with apples.